This year’s global average surface temperature is likely to be the warmest on record according to data from the Met Office, and is expected to continue the trend showing 15 of the top 16 warmest years have happened since 2001. These findings concur with the World Meteorological Organisation (WMO) findings also announced today. Provisional figures up to the end of October show this year’s near-surface global temperature as estimated from the HadCRUT dataset has been around 0.71 ±0.1 °C above the 1961-1990 average of 14.0 °C. This is in-line with the Met Office’s forecast, issued in December 2014, which predicted 2015 global temperatures would be between 0.52 °C and 0.76 °C* above the 1961-1990 average, with a central estimate of 0.64 °C. In HadCRUT, this year is clearly warmer than 2014, the previous nominal warmest year in the record, which was 0.57 ±0.1 °C above the 1961-1990 average. The HadCRUT dataset, jointly compiled by the Met Office and Climatic Research Unit at the University of East Anglia, uses data from more than 6, 000 observation sites around the world and observations from ships and buoys at sea. It is recognised as one of the world’s leading indices of global temperature. 2015 is set to mark the first time in the record that annual global temperatures reach 1 °C above ‘pre-industrial’ temperatures (taken here as an average of the 1850-1900 period*). This is important because governments around the world have agreed the aim of trying to limit warming to 2 °C or less above pre-industrial to try to avoid the most dangerous impacts of climate change. Findings from HadCRUT are very similar to independently-run global temperature datasets compiled by the US National Oceanic and Atmospheric Administration and NASA Goddard Institute of Space Studies. Information from all three datasets is included in an announcement from the World Meteorological Organization (WMO) on global temperature, which also concludes this year is likely to be the warmest on record. 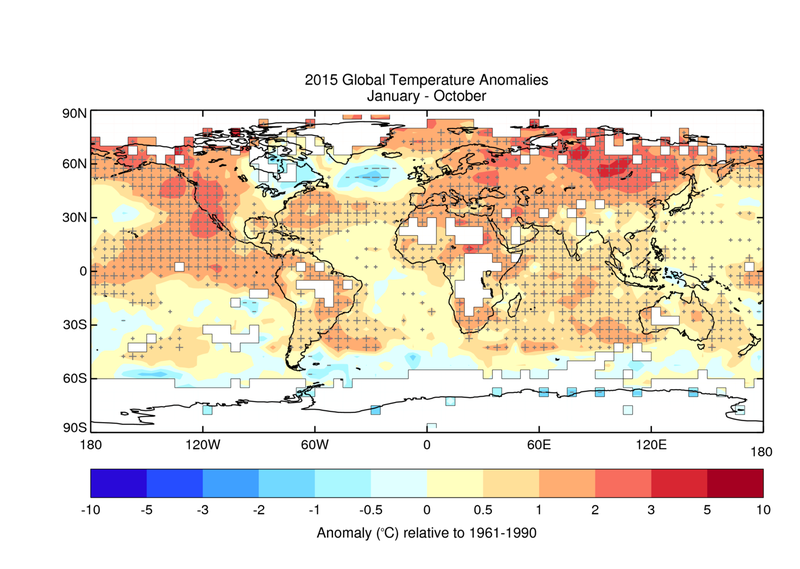 Where did 2015’s warmth come from? This year has seen a strong El Niño develop, with unusually warm sea surface temperatures across the Tropical Pacific, releasing heat into the atmosphere and pushing up global temperatures. While this has contributed to 2015’s warmth, this is likely to be comparatively small compared to the long-term influence of warming caused by human greenhouse gas emissions. This is backed up by research from the Met Office last year which showed global temperatures seen in recent years would be highly unlikely in a world without human influence on the climate. What’s in store for the year ahead? Last year saw record or near record warmth globally, this year is warmer still and the current expectation is that next year will also be warm. This is due to two factors: firstly, the ongoing warming due to human influence, and secondly although the current El Niño is expected to peak around the end of this year, its main warming influence is usually felt in the months afterwards. For example, a strong El Niño peaked at the end of 1997 – but it was 1998 which went on to become a record (at the time) by some margin. There are other natural factors – such as changes in longer term ocean cycles or volcanic eruptions – which could act to reduce global temperatures next year, so there will always be some uncertainty. The Met Office will give more detail in the expected global temperature for 2016 when it publishes its forecast in the latter part of December. * While late 19th century temperatures are commonly taken to be indicative of pre-industrial, there is no fixed period that is used as standard and a variety of other periods have been used for observational and palaeo datasets. There are limitations in available data in the early instrumental record, making the average temperature in the reference period less certain. There is not a reliable indicator of global temperatures back to 1750, which is the era widely assumed to represent pre-industrial conditions. Therefore 1850-1900 is chosen here as the most reliable reference period, which also corresponds to the period chosen by IPCC to represent a suitable earlier reference period. This entry was posted in Met Office News and tagged climate, climate change, climate science, El Nino, global average temperatures, global temperature, global warming, hadcrut4, Met Office, Met Office Hadley Centre, NASA, NASA GISS, NOAA, record, statistics, temperature, WMO, World Meteorological Organization. Bookmark the permalink. Nicely timed for the start of the UN Climate conference which starts in Paris next Monday I seem to remember. There are no flies on the UKMO! I see the Met Office is in full propaganda mode for the Paris climate shindig. What a pity both the much more reliable satellite data sets show that 2015 is only expected to be the 4th warmest in the last 17 years. Of course it would have been inconvenient for the Met Office to have mentioned that piece of information, doesn’t quite have the same impact as the warmest evah. I’m afraid the HadCRUT and NOAA datasets have been so corrupted, homogenised and generally fiddled with, that only the most gullible now place any faith in them. It’s a great pity because there have been a great many people who have given their time over many years to diligently record data, only for the climate scientists to tell them they knew better what the temperatures were all along. The satellite record measures temperatures in the atmosphere above the surface. This is more sensitive to El Nino events than the surface record is. This means that in practice you always have to wait for a ‘big one’ to come along to get the next record. The current event is just such a ‘big one’ so we would expect a record – albeit once the event has fully played out next year. Anyhow, while its fun to note these records, they are not, of themselves that important in reckoning the evidence for climate warming. That comes more from long-term (30 year+) trends in all sorts of data, including both the various surface and satellite data, plus many many others. These show plenty of evidence for warming. Appealing to some ‘conspiracy of science’ is getting increasingly tired. If you don’t like the two surface datasets you mention, there are plenty made by other people, except they say basically the same. And all sorts of data sets of other types of measurements, including the satellite data, point the same way. Clearly you don’t appear to know that all of the surface data sets are derived from the same data, so it’s hardly surprising that they should all be similar. Unfortunately the data used to produce the various records has all been homogenised and molested before being used as input to the various surface datasets which essentially only differ in their method of analysis. Interestingly, the Bogus “greenhouse gas theory” would tell you that the immediate surface warming would be strongly coupled by “radiative heat trapping” rubbish to cause an immediate warming of the troposphere with its low heat capacity. It’s all speed of light, remember? All radiation dominated, is it not? Why do we have to wait two months for convective overturning of the Hadley cell? I said “all sorts” of measurements – not just surface measurements. That includes buoy- and ship-based measurements of the ocean interior, satellites for the atmosphere away from the surface and ice extents, snow amounts and sea levels. Even glaciers by people with maps and clipboards! And so on. Take your pick. They all paint the same picture of change when you look at 30 year + trends. I am not an expert, I don’t know enough of the atmospheric physics to say whether it should be instantaneous or not. But then I am fairly certain you don’t either. You talk about “radiative trapping”, which is part of the co2 mechanism, but you do so in the context of the response to El Nino. This does not make any sense. There may be a very good scientific reason why there is a delay so I am not going to speculate. Given your performance, I’d recommend you don’t either. In absence of a mechanism, we can clear this up by looking at a past example. In the big 97-98 El Nino, the tropical Pacific sea temps peaked in Dec 97. Satellite atmospheric temperatures didn’t pick up much before the peak and only grew to really marked levels in the first half of 1998. So however it comes about, a lag is observed, regardless of your hypothesis. And similarly, any lack of a surge in satellite temps this year is not yet an inconsistency. Long term trends over the last 35 years show little difference in the amount of warming at the surface and higher in the atmosphere. 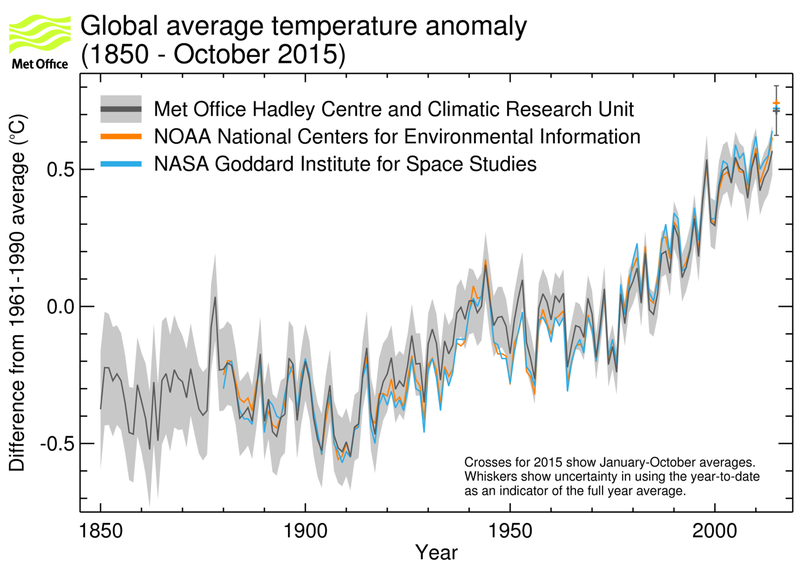 The warmest world year on record is not propaganda, it is a scientific fact. Not according to the much more accurate satellite record. Results just out to end November 2015 show cooling in November despite presence of El Nino. 2015 is not going to be anywhere near record, could be 4th warmest year in last 17 years though. Doesn’t have the same ring as warmest evah, for those attending the Paris jamboree, but empirical evidence has a habit of steamrollering propaganda. Anyone interested in a more accurate picture of recent temperatures can search for the latest satellite data from NASA UAH and RSS datasets. These cover around 95% of the earths surface instead of the HadCRUT and NOAA data which only covers around 70%, and even then very sparsely in many countries. But only reflect conditions 3-5 km up where no one at all lives. I think you need to go back to science class. The troposphere starts at the earth’s surface. If you think that a planets troposphere is not coupled to its troposphere then you shouldn’t be commenting here. It is possible to calculate a global mean annual surface temperature from several kilometres altitude through massive but irrelevant opacity changes. That is, without considering “greenhouse gases” or long wave radiation. Gravity set the density, pressure and temperature gradients. You can be as patronising as you like, it doesn’t alter the facts. You are the only one hurt by comments like that. The very briefest of internet research on satellite atmospheric temperature measurements will reveal that the retrievals are based on radiances from broad height ranges, even the lowest of which are weighted towards the mid-troposphere more than the near-surface. So it measures something quite distinct from the surface measurements. Which isn’t so surprising, I would have thought, as the people making these satellite measurements probably do so because its complementary to the surface measurements. As long as the moderator here continues to accept my posts I shall post comments as and when I please. Talking of moderation, I would have thought that you might be in danger of being excluded, although having said that I don’t suppose that irrelevance and incomprehensibility strictly constitute a break of the house rules. I defy anyone to make any sense of that post. You really are up against it when all you an do is link together random science words and hope that people are impressed. Believe me, they are not – it just looks eccentric. Ironically at my weather station in Cumbria temperatures have been below normal all year apart from November so far. Just you wait until the Met Office/NOAA algorithm get a hold of your data they’ll soon sort it out for you. These conferences are timed for late Nov or early Dec – when data for the year just about to end are likely to first be available. Makes sense to me. It may make sense to you Haworth-Roberts, but what has 10 months weather data got to do with long term government policy? Thank you Met Office for including the error bars in the data presented. As you have indicated 2015 to be somewhere between 14.61 and 14.81degC with 95% certainty whereas 2014 was somewhere between 14.47 and 14.67degC again with 95% certainty, the overlapping error bars render the difference statistically insignificant. This being ‘despite’ of a powerful El Niño! Which helps explain why we don’t know Earth’s temperature to within +/- 0.5degC (as NCEP, GISS ECMWF etc all disagree about analysed T) but are willing to suggest anomalies to 0.01deg resolution! We also have the problem of comparing data collection currently with years without such spatial and temporal resolution. For instance the baseline you have chosen here MET, starts in 1961 but now boasts of data from over 6000 sites, ships and buoys. Not to mention the satellite data available and polar regions with manned or automatic instrumentation, that, if necessary today, must render early estimates of global temperatures highly inaccurate at best. We only really have around 35 years of directly comparable, high resolution, reasonably accurate data. On top of this a thousand years ago it was the Medieval Warm Period, followed by the Little Ice Age, and recovering from that, as we potentially run towards another great warming plateau (but at the end of this interglacial) we find ourselves being told that although the Earth can and does continuously alter climatically all by itself, now only man’s efforts influence it. Without us it would be perfect, and stable, forever. Sorry nuwurld, that is technically not the correct way to combine the errors. You can’t just look too see if the bars overlap as a test of distinguishability. The error bars reflect the uncertainty in each individual number. So for the 2015 temp to be less than 2014, the 2015 number would have to be low in the stated range (maybe less the 10% point of the range) and the 2014 high (maybe 90% point of its range). By chance, there is a 10% probability of each of these things individually happening and so only a 1% chance of both happening (10% of 10%). This is much less likely than the 5% test usually used. In other words, 2015 temperatures could well be statistically warmer than 2014 at the 95% level as long as the error bars don’t overlap too much, which they do not appear to. In any case, whether one year’s temperature estimate is higher than another’s in statistically definite terms does not have much relevance to whether or not there is global warming. The stats of long-term (30 year +) trends are not statistically ambiguous. Go on, tell me the “exact” temperature of the globe in 2014 and the clearly higher “exact” temperature in 2015 as predicted at its closure. Exactly how much warmer? So you obviously failed to read that I clearly said the Earth “can” and “does” do this all by itself. No – we are saying something different. I am saying that it could be statistically distinguishable, you are saying it definitely is not. From my perspective, only doing the calculation will tell. I did not do that, but it could be done. But you have already decided on the answer. Somehow. By some means you don’t reveal. As far as the much more comprehensive and accurate satellites, 2015 will finish well below both 1998 and 2010. Strange that the Met Office should not mention them. The in situ surface and satellite lower tropospheric temperature records are records of two different, albeit related, quantities. Globally averaged surface and lower troposphere temperature records show similar variation and warming since the beginning of the satellite records in the 1980s, although they do not track one another perfectly at all times. If we accept what you say then you appear to have stated that the warming seen in the land based temperature data is almost all caused by the El Nino, a weather event given that satellite temps have not risen much. What a pity the Met Office, along with most alarmists, have been claiming that man made CO2 has been responsible for the same rise in temperature. Paris propaganda I assume. Nowhere does it say that. It says satellite temperatures haven’t risen much because we have not got to the point in El Nino event where we would expect to see the troposphere temperature’s largest response. You appear to have missed the part where it’s being claimed the discrepancy between surface dataset and satellite readings are due to lag in recording the effect of El Nino. Since the satellite record has yet to register any significant effect from El Nino yet, then the divergence must by deduction, if the claim by the Met Office is correct, be very largely due to the El Nino. Yes, at the convective rate. I think you are forgetting the rules of the “radiative greenhouse effect” that you have sworn allegiance to. So the low heat capacity troposphere should, according to this rubbish, heat up in real time, no? Maybe they are not right, maybe the main effect of El Nino at the surface has also yet to be fully realised, just like in the satellite data. We’ll see in the coming months. What are you talking about? I haven’t ‘sworn allegiance’ to anything. I am just here pursuing an interest in weather and climate. I wonder what your motivation is? Observed examples such as the 1997-8 El Nino show there is a lag, so there must be some mechanism by which this occurs, even though its not apparent to either of us. At the same time, both the surface and atmospheric temperatures have risen by similar proportions over the last 35 years. Some aspect of the physics must makes both aspects of this relationship work: similarity on the long timescale and a lag for El Nino. Indeed we will see, but it’s not looking good for your case at this point. Both the satellite datasets show a slight fall in temperatures during November. Any chance of a link to back up your claims this time? Not sure thats totally helpful. For one, there is more than one group doing this yet they come up with essentially the same result. And even if one group are sceptics, then they are honest enough that it is not coming through in their results. UAH shows long-term warming like everything else, so there isn’t all that much point in knocking their motivations. They might actually just be scientists that have sufficient detachment to be able to separate what they think from what they can show. What are you talking about Haworth-Roberts. The UAH dataset is produced by NASA. I don’t think you could by any stretch of the imagination accuse them of being sceptics. I realise their data is perhaps rather inconvenient for our beliefs, but there’s nothing I can do about that. If you don’t like the UAH data then why don’t you try the RSS satellite data Haworth-Roberts. It’s not going to please you any better by the sound of things, despite being produced by a quite different methodology.